He is the mestre of Associação Kadara Capoeira. With more than 30 years of capoeira, he has visited many countries to spread the art. For his students, he is a strict but also patient teacher, who pushes his students to be their best. 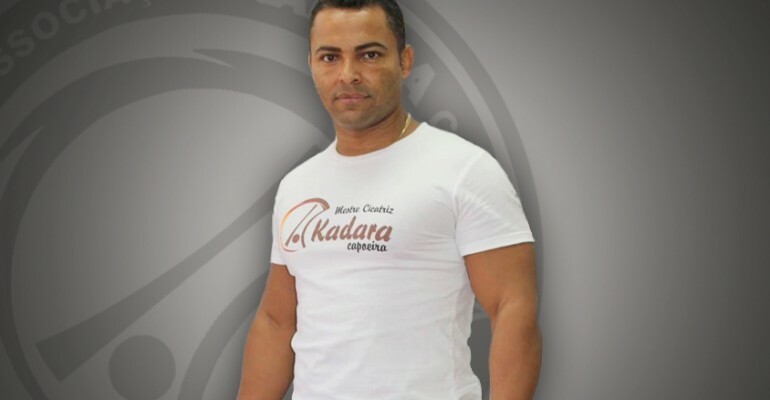 For the teachers and students in Kadara Capoeira, he is more than a mestre. He is also a father figure, a brother, a true friend. He is indeed a person with integrity who leads with compassion, who seeks to contribute for a better world through the art of capoeira. Capoeira entered my life even before I entered the world. I, Alessandro Gomes de Reis, was born in November 1974 but those close to me say that the tiny Mestre (Master) Cicatriz was doing ginga in the womb long before that. I can’t remember that far back, but I probably enjoyed the echoes of the atabaque and the berimbau just as much as my pregnant mother’s habit of watching rodas that my older brother participated. Capoeira has always been part of my life. My obsession with the sport turned into an addiction in 1982, when I was eight years old. Seeing my older brothers arrive home, sweaty and exhausted, made me realize that Capoeira was not only a physical challenge but a psychological one as well. It not only disciplined my brothers to survive the most dangerous of rodas, but to survive the great roda of life and fight for their own place in this world. It gave them a second family, friends and positive role models to look up to. This social aspect and unity is what I value in Capoeira. Many people do not realize it, but Capoeira does not limit itself to kicks and esquivas. It’s not just a fight, a simple dance or a martial art pretty to see. Capoeira is all this and much more. It’s a psychological discipline, a philosophy, a physical challenge and a social encounter. Its teachings, if used with good intentions, can be applied to many aspects of life. My success in Capoeira has much to do with the support I have received from those closest to me. This of course refers to my Master who has been there for me from the beginning till this very day. Mestre Lotar has had a double dose of me – both as a student and as an annoying child who imposed himself as a permanent visitor in his house. Considering him a fatherly figure after the loss of my own father, I feasted, slept, played and trained under the roof of Mestre Lotar and without fail, I put up a fight when my mother came to reclaim her son and drag him home. As an adolescent I found myself on the streets of Rio parading the new bike that my father had given me. It represented the fruit of my father’s labour and therefore I decided it was worth my life. As it was, I was assaulted by two hooligans who, unable to release my grip of the bike, thought it might help to cut my chest open with a knife. Well it did help: the blood scared them away while I tightened my grip on the toy. The fact that my intestines were on display was of no importance. The fact I had not lost my bike, was. And so I went home fearing nothing but my father’s condolence of my foolish bravery. I therefore decided to hide the blood cascading from my chest under a white sheet and sleep the night away I don’t give in. You can hurt me, but I know the pain will go and the wounds will scar – that’s why I am Mestre Cicatriz! My life’s worth of experience in Capoeira has led me to Paraguay, Argentina, Venezuela, Chile and the United States. I have queixadad the Caribbean, exchanged the ginga for sushi in Japan and finally came to settle down in Australia, where I continue to learn through my teaching. In all honesty, I believe I will never stop being a student � there will always be something else to conquer. Capoeira is not a picture that you can finish with one stroke of the paintbrush, hang up on the wall and admire for years on end. Capoeira is an art that needs to be retouched and perfected continuously. It is an ever-evolving phenomenon for the perfection of which even a lifetime is insufficient. One of the self-set challenges which I really want to accomplish is to share my love and knowledge of Capoeira with the world. I want others to experience the adrenalin, the pride, the fear, the joy, the strife, the highs, the lows, the suffering and the well being that Capoeira has brought into my life and I want them to become better people because of it. It is a great challenge but one that we can achieve together with the students and the community. After more than 30 years in the art of Capoeira, I decided it is time for me to found my own group, where I can apply my philosophy in spreading this art all over the world. I hope to gather people with the same values in life that I adhere to and the same objectives that I set for the group. This is a new journey for me and for Kadara Capoeira, a journey with clear vision and values, as well as clear objectives that we in Kadara Capoeira strive to achieve.